Five STF personnel sustained bullet injuries, three of them critically during two separate encounters with Maoists in Sukma. Sukma Encounter: Evacuation of five injured jawans from Tondamarka to Raipur. Raipur: Two security personnel were killed and five others injured, three of them critically, in two separate encounters with Maoists in Chhattisgarh's Sukma district, police said on Saturday. One Maoist was also gunned down during the operation, they said. "While two district reserve guard (DRG) jawans were killed, five special task force (STF) personnel injured in two gunbattles between a joint team of security forces and ultras under Chintagufa police station limits in the district," Special DGP (anti-Maoist operations) D M Awasthi told PTI. A squad of the STF, the DRG, the Central Reserve Police Force (CRPF) and its elite unit-CoBRA (Commando Battalion for Resolute Action) was out on the operation based on inputs about the location of Maoist hideouts in the interiors of Chintagufa, around 500 km away from Raipur, since Friday. When the security forces were today around 10.30 am advancing through the forests of Dondamarka, a Maoist den, armed Maoists started firing indiscriminately on them, leading to a gun-battle between both the sides, he said. "Five STF personnel sustained bullet injuries, three of them critically, in the face-off following which reinforcement was sent to evacuate them," the Special DGP said. 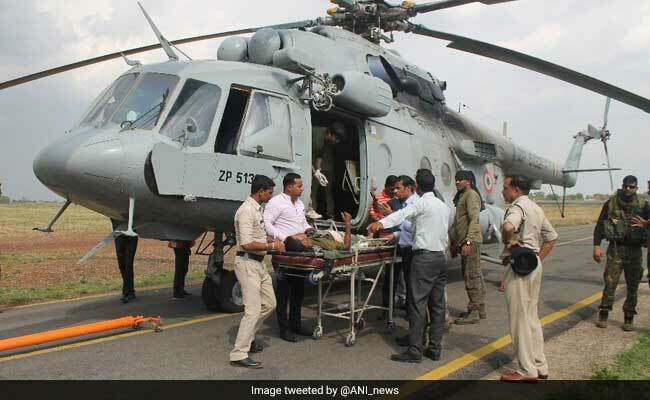 The injured were airlifted to Raipur and admitted at a private hospital. While cordoning off the region, the team of security forces was on their way back to the base when it again came under heavy firing from the ultras near Durma village at around 3.30 pm in which two DRG jawans were killed, he said. Additional forces were rushed to the spot and bodies of the two jawans were being retrieved from the forest, he said. "Over a dozen Maoists were killed during the operation, but their colleagues managed to drag their bodies deep into the jungle. However, body of one Maoist was recovered," the SDGP claimed, adding further details are awaited. On April 24, 25 CRPF personnel were killed in a Maoist ambush in Burkapal area under Chintagufa police station of limits of Sukma.